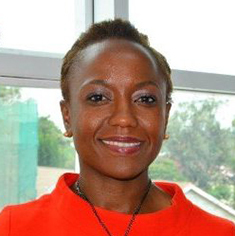 DAI’s Kanini Mutooni, director for investment at the East Africa Trade and Investment Hub, was recently appointed to the board of directors of the Global Innovation Fund. The $200 million London-based fund invests in evidence-based innovations with strong potential for social impact, supports innovators, scales up successes, and provides financing options. The fund was established in partnership with Omidyar Network in 2014 by governments of the United States, United Kingdom, Sweden, and Australia. Based in Nairobi, Kenya, and funded by the U.S. Agency for International Development (USAID), the East Africa Trade and Investment Hub is an eight-country initiative to deepen regional integration, strengthen select agricultural value chains, promote trade, and facilitate investment and technology. As director for investment, Mutooni, pictured left, oversees the Hub’s due diligence, financial analysis, market intelligence, deal structuring, and fundraising support. In March, Mutooni represented the Hub in Geneva at the meeting of the United Nations Conference on Trade and Development World Economic Forum’s National Planning Committee. Since its launch in 2014, the Hub’s investment unit has supported the close of more than $26 million in deals originated in the East African region in agribusiness, financial services, and ICT. The Hub’s goal is to facilitate $100 million in investments and create 10,000 jobs by project’s end in August 2019. Mutooni’s appointment at the Global Innovation Fund deepens DAI’s commitment to promoting and applying innovation for development, most recently demonstrated through the Innovation into Action Challenge and DAI’s support of USAID’s Center for Development Innovation.